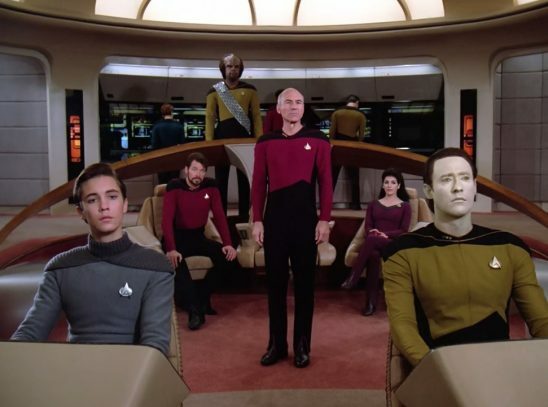 In the Star Trek universe, computers translate unheard languages without any data. If you’re a writer of fantasy and scifi, language is literally indispensable. And because it’s something we use every day, many authors think they can change it up without doing any research. I’m all for experimentation, but knowing the essentials of how language works can make your writing much better. To that end, I’ll cover a few misconceptions I see in spec fic media and give you some advice on how to get it right. This is a pretty huge one: lots of books draw a logical connection between a character’s language and some fundamental aspect of their character, usually morality. This most often takes the form of “bad guys” speaking a “bad-sounding” language (more on that later), but it can be more abstract as well. Tolkien, whose achievements as a conlanger and scholar can’t be overstated, was actually pretty bad about this. For example, the language created by Sauron to be spoken in Mordor, Black Speech, is described in morally coded, value-judgment terms: while Sauron and the Nazgul speak ancient and “pure” Black Speech, the form spoken in Barad Dur is described as “debased” or “corrupted” by lowly Orkish influences. Plus, the orcs in Tolkien’s works speak only a “pidgin” of elements from various languages unless Black Speech is imposed on them. The way Tolkien describes Orkish is pretty deterministic: their languages “diversify” because they hate each other so much that orc communities reject the idea of a common tongue. 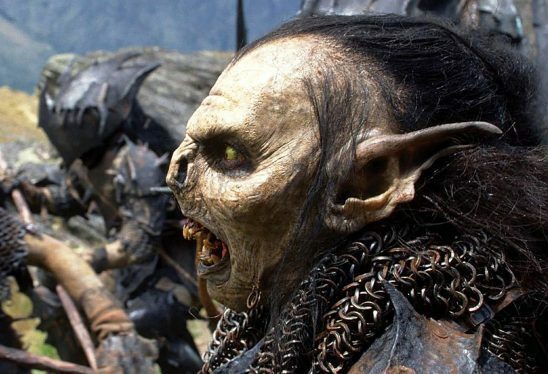 But even allowing that orcs don’t feel the human impulse for interconnectivity, language is used to communicate: it naturally develops based on who the speaker has contact with. If orc languages are diverse, it is because their communities are isolated from each other, not the other way around. Generally speaking, drawing strong connections between the language a character speaks and their implicit moral character smacks of prejudice and leaves little room for nuance. It encourages assumptions about a person based on the language that they speak, beyond where they’re from or where they were educated. If you have the impulse to use language as a shorthand for morality in your story, stop and think why first – why couldn’t the bad guys speak the same language as the good guys? Are they really so different? 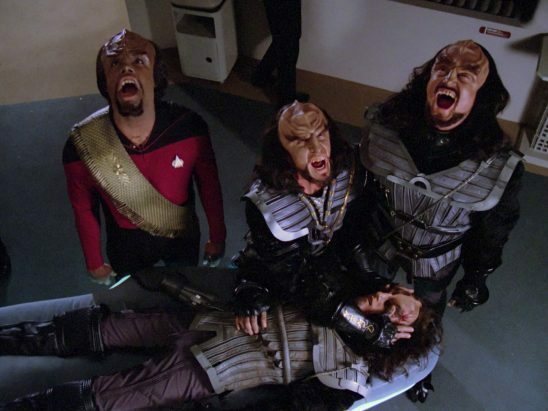 Klingon is mostly yelling, admittedly. Moving directly on from my last point, describing the language spoken by a bad guy as harsh, rasping, guttural, or otherwise difficult to listen to is outdated in the same way that the ideas behind phrenology are outdated. Speaking from a purely phonetic standpoint, it’s actually very hard to draw sweeping conclusions about how a language sounds. For instance, what exactly does “guttural” mean? Does the language involve lots of uvular fricatives or trills, like Arabic? Is it highly glottal, like Scottish English? What does “rasping” mean? Does the language heavily aspirate some or all of its consonants, like Thai? Are there a large number of voiceless fricatives, like Toda, indigenous to southern India? If there are “difficult” sounds, how have they been preserved? Languages change to maximize ease of pronunciation. Furthermore, “difficult to pronounce” or “harsh” are extremely subjective concepts. Sounds that are unpleasant or difficult for Arabic speakers will be very different from sounds that are difficult for Vietnamese speakers. It can be easy to fall into this descriptive trap with existing languages (like German), which is an excellent way to alienate bilingual readers. This is connected to the linguistic determinism of the previous section. I encountered this idea most recently in Patrick Rothfuss’s The Name of the Wind. The book has a scene where the protagonist, Kvothe, encounters an old herdsman he needs to get information from. Kvothe has never been to the guy’s home village, and they’ve exchanged only a few words at this point in the story. Yet somehow he buddies up to the herdsman by speaking in a dialect that sounds… hokey? Backwoodsy? Supposedly, it sounds something like how the herdsman speaks, based on the fact that he’s from an isolated community. Kvothe gives some kind of explanation that the herdsman speaks the way people used to speak. The problem with this is that there’s absolutely nothing unique about the herdsman’s social circumstances or environment that determines how his language might sound. * There’s no such thing as a universal “archaic” dialect, a “country” dialect, or a way people “used to speak.” The herdsman’s language might be less exposed to outside influences and therefore might change less rapidly than another, more widely spoken language. However, that isolation would make it less easy to guess how the language sounds, not more. That brings me to my next point. This ancient cuneiform tablet is a long complaint about poor quality copper. We generally think of dead or “ancient” languages as fundamentally different than the languages we speak today. After all, people’s lives were different from how they are now, so why shouldn’t their languages be? The problem is that, while the possible variations in human living conditions are nearly infinite, languages are constrained by human physiology. There are only so many contortions the human tongue and vocal cords are capable of, so this limits the possible sounds available. Human brains are only capable of processing information organized in a limited number of ways, which limits possible variations in word order. Furthermore, there’s a constant push-pull in language between ease of use and expressiveness. This means that speakers are always coming up with new ways to make language easier to use. * However, ideas need high levels of variation to be expressed efficiently, so we’re always inventing new words, too. This push-pull drives language change and can be affected by cultural and historical circumstances to make languages change faster or slower. So while human technology moves from less to more advanced, what is “advanced” in language is not so easy to define, and the two don’t map onto each other easily. Languages spoken in the past were neither more nor less complex than the languages we speak today. In Naomi Novik’s Temeraire books, dragons are intelligent beings that come out of the egg already speaking and understanding the languages being used around them. This is an important plot point a few times, and I’m extremely biased in Novik’s favor, so I’m willing to suspend disbelief in this instance. * But generally speaking, language does not work this way. Language is learned only when the learner is exposed to lots of data. Very young children, lacking language, are like sponges for linguistic data. They use lots of observation to learn rules and extrapolate outward until they are fluent. Limiting the amount of linguistic data a young child is exposed to can do serious harm to their ability to communicate later in life. In essence, language learning requires the learner to be exposed to both a thing and the word for a thing before that bit of language can be learned. Just hearing how a language sounds, looking at an ancient scroll, or receiving a waveform of an alien transmission is not enough to learn or decipher a language! 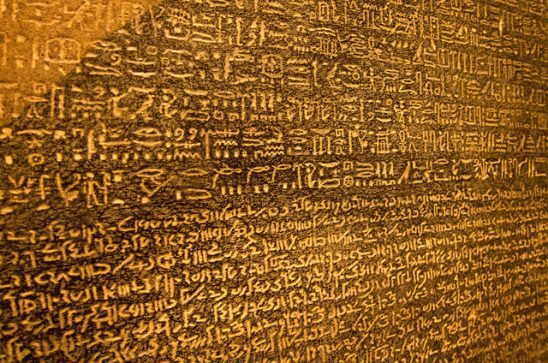 The Rosetta Stone wasn’t deciphered until someone who could understand part of it looked at the rest. So while I’m willing to allow that a dragon in the shell might learn the words for, say, hot and cold, the dragon wouldn’t be exposed to enough data to come out of the shell knowing words for abstract concepts. I’ve most recently encountered this mistake in Ada Palmer’s Terra Ignota series, which is really an exceptional work of science fiction in nearly every other sense. This series takes place in the year 2454, on an Earth that has done away with geographical nations in favor of supranational governments called hives, which citizens join by choice. This system, and the worldbuilding in these books in general, is incredibly well-developed, but it plays fast and loose with language in one essential way. Part of the ambiguously utopian future of Terra Ignota is that there is a strong taboo against using gendered language. The books are written in English, but hives have different official languages, so speech at the narrative level in different languages is marked with different styles of quotation marks, i.e. square brackets, arrows, etc. No matter what language the characters are ostensibly speaking, they neatly avoid (unless they’re breaking the taboo) using gendered language to refer to themselves and others. The problem is that not every language uses gender in the same way that English does. It’s not enough to put a ban on “he” and “she” and only use “they.” For Spanish speakers you’d have to come up with an entirely new pronoun and new words for things like “student,” “actor,” “doctor,” and so on. In Japanese, you have kind of the opposite problem: there are no gender pronouns in the third person, but there are linguistic patterns and modes of speech that strongly signal the speaker’s gender role – to enforce the taboo, you’d have to ban entire modes of speech! Chinese has no word for “sibling,” so you’d have to coin something new for that. There are languages you’d have to entirely recreate, then somehow enforce the revisions on the populace – not exactly the best use of resources and time! This misconception is often bandied around as some secret of the universe. The actual hypothesis is called linguistic relativity, and it essentially says that the language a person speaks determines the way they think. This does kind of hold up in some circumstances. For example, speakers of languages with lots of different words for shades of the same color will generally be better at identifying or at least articulating differences in shades when tested. However, it’s not true that speakers of a language that doesn’t, for example, have a direct translation for “thank you” won’t understand the concept of gratitude. A work that consciously plays with linguistic relativity is Story of Your Life by Ted Chiang. 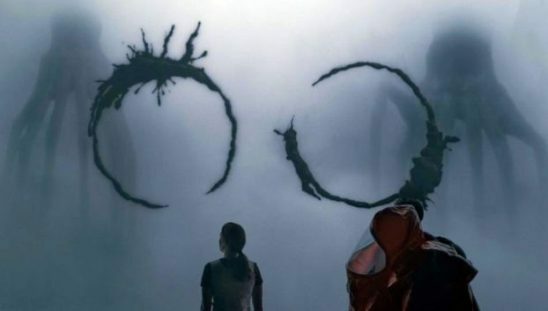 In this short story, and in the film based on it (Arrival), the main character encounters aliens who have a different way of conceptualizing and communicating about time. As a result of learning to write their language, the main character begins to see forward in time, which has huge implications for her life, the world, and the plot of the story. This is a great example of a story that takes a linguistic phenomenon and uses it to its full narrative potential. But, as much as I love this story, the human brain doesn’t work this way. Unless your story explicitly takes place in a world where the human brain works differently, think very hard before drawing a connection between a character’s language and what they are able to envision or understand. It’s very tempting to use language as a poetic shorthand or a symbol of the differences between two characters, but this can be dangerous if left unexamined. Very often, these stories uphold an uneven power dynamic. For example, differences in language have historically been used to frame Inuit and Yupik peoples as naïve, innocent, and primitive. It’s easy to understand why research is necessary if you want to create a story with believable scientific or historical detail. When it comes to language, though, lots of writers think they can skate by without putting in much effort. But language is as complex as building cities and making war. 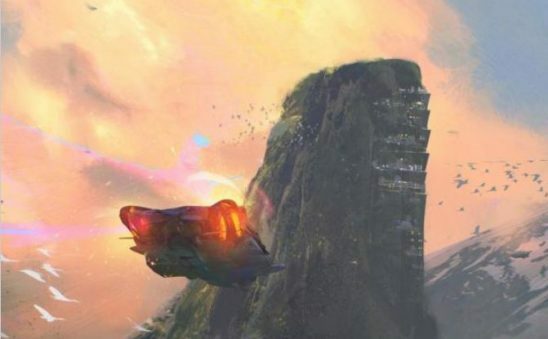 If you put enough effort into worldbuilding to make your fantasy or scifi culture believable from a historical or ecological standpoint, you can do it for language use too. Just do some research. The world has vast linguistic diversity; there’s incredible potential for experimentation and speculation that isn’t complete nonsense. Especially not something Kvothe would know about. Think simplified Chinese characters or internet abbreviations. Dragons are cool and smart, okay?! While there are problems with it in execution, #6 is an interesting one. While gendered languages are almost certainly here to stay, the idea is problematic. The biggest issue is that it leads to bias in more ways than one. Keys are male in German and female in French, which means that Germans more easily refer to them as jagged while the French refer to them as intricate. It is also more clunky in general, without any real advantage. For #7, 1984 is another example in a somewhat different sense that is somewhat interesting(and just as wrong). As a part of the idea of increased government control, one of their tactics is “Newspeak,” a reduction in the number of words as a means to decrease complex thought that could be a threat to the government. The word warm was an example that was deleted, replaced with “uncold.” The problem is that the underlying idea of warmth is still there, and even more complex and subversive ideas like democracy would also still exist in some sense even without a proper word to discuss it. Which would only mean that a new word would eventually be developed. However, there is a variation on this concept that is true, as language is a useful window into a culture and what they value. The color example is a nice case of this. If you have a coastal culture, they will be more likely to distinguish between blues, in contrast to a jungle culture that will be more likely to distinguish between greens. Both groups still recognize the full range of colors, but they each care more about minor differences between different ones. It should also be noted that gender (in the linguistic sense) does not necessarily mean male and female. Some languages have male, female, and neuter. Or gendered and ungendered. Or animate and inanimate. The word for girl in Irish is masculine and stallion is feminine. Grammatical gender has very little to do with biology or social roles. For a long time after that, they were required languages for everyone in academia in Europe, so they were used. Latin was the language of science, which is why everything is biology named in Latin (unless it was discovered very recently). The necromancy angle is, of course, also very important. How could the church have gotten that wealthy and influential without the information the dead could provide? Patrick Rothfuss has both a great and a terrible example of this in his books. The terrible example is the one you mentioned in the article, which is made even worse by the accent being written directly into the text. I have English as my second language, so it was pretty jarring. The great example is the sign language of the Adem people in book two. Aside from normal speaking, they use their hands to sign and convey subtle emotional cues. It was very interesting to read about. Contemplating a subversion of #1: A character’s language is described as such for one POV, and after a POV shift, the same character’s language is described in neutral or even positive terms. When I played an RPG set in Middle Earth my official interpretation of Black Speech was that it had specifically designed by Sauron as essentially a code and had therefore been made both unpleasant to hear and difficult to learn in order to make the code more difficult for his enemies to break. Latin and Greek have the mystique that they do in Western civilization because for several centuries they were the lingua franca of the educated elite of western civilization and because they are languages associated with a heavily mythologized common past. Classical Arabic and Chinese play a similar role in Islamic and Chinese civilizations respectively. In some societies (I’m aware of this in India and Japan but it’s probably found in other places as well) English is starting to acquire this kind of cachet since it’s the language of the global cosmopolitan elite in our era. It’s worth noting that, although the specific example you used for 6 is correct. There is also a sense in which all (human) grammatical systems ‘work the same way’ though as I understand it has more to do with the basics of sentence structure and parts of speech. I’m pleasantly surprised to see you so clearly reject the Saphir-Whorf hypothesis, most of the social justice sphere that I’ve encountered is pretty attached to that as part of their general blank-slateism. There is some debate amoungst linguists as to whether or not there are some grammatical rules that all languages follow. Also there’s a law in France forbidding advertisers such that they can not use English words in advertising. There was a trend to use English words as they were seen by the French as particularly “swanky”. It was fine for caché or café or décor to become part of English when French was the lingua franca. France had a law on the books until the 1990s requiring all babies to be registered with the name of a catholic saint in order to receive a birth certificate (despite being a nominally secular state) and once seriously discussed banning texting for fear that abbreviations were mangling their language. Let’s just say that France is a bundle of cultural and linguistic insecurities and leave it at that. 1. It has vowel sounds – the sounds you can make without moving your mouth. “Oooo”, “aaaaah”, “eeeeeee”, etc. 2. It does NOT use the “phthbphhtbtph” (aka raspberry, ‘Bronx cheer’) sound. Possibly because it sounds too much like a bodily noise. 3. It has nouns, verbs, and pronouns. 4. If a language has terms for “feet” and “toes”, it ALSO has terms for “hands” and “fingers”. And, obviously, language is limited to the sounds the human throat can produce and those the human ear can hear. It’s interesting to see that the ability to distinguish between different shades of a colour has a lot to do with where someone grew up. Richard, I’m afraid he needs to revise point three. Some ancient languages do not have pronouns, at least not like we have pronouns. They are not separate words but are determined by the ending of the verb (or noun). The oldest form of Hebrew is one such example. Most (more or less) fully declined languages at least make the pronouns a matter of emphasis. So for example, the following name is actually a complete sentence in Hebrew: Elijah = El (God) + i (my) + J(y)ah (YHWH), which in English translates as My God is YHWH. However the particle “i” cannot be used independently, it must attach to a noun. This is actually happening in New Zealand right now. Te Reo Maori is a beautiful language, but few people have the time or resources to learn it as a second language (it there are still people wanting to make it compulsory to learn Te Reo in school). So, there is currently a huge push from academia and government to hybridise English and Te Reo. This is bad for Te Reo because the syntax of the two languages are completely different, so students have to unlearn the incorrect structures around the Te Reo words they already know. It will also put our children at a sever disadvantage on the world stage, as many of the words they grow up thinking are english (because their language is officially english) are completely unknown to the rest of the world. Any way, that’s just a real world example of people wanting to change a language because of irrational ‘my tribe is better than your tribe’ reasons. But with the internet and tv dead, we’ll all soon be speaking Chinglish anyway. A pet peeve of mine: In all fic, not just spec fic, non-native English speakers often speak in really strange ways. In the modern world, pretty much everyone in science/academia speaks very good English, because that’s essential to having a career in that area. Of course, most non-native speakers still have a foreign accent, but unless their native language is VERY far removed from English (say, Chinese), the accent won’t be that heavy. They’ll also make the occasional mistake re words or grammar, but they won’t consistently make funny mistakes. A regular, say, German, who DOES NOT work in academia or science (or any other area where speaking lots and lots of English and interacting with people from all over the world comes with the job) could very well speak with a heavy German accent and makes lots of mistakes, but a world-famous German scientist won’t. Furthermore, non-native speakers of English don’t substitute words in their own language for easily learned English words like “friend” or “wait” or “hello”. Non-native speakers sometimes throw in a word from their own language if they can’t find the English word. This can be rational if there are other people present who know both your own language and English, since they might be able to translate it for you. If no one else could possibly know it’s a pretty irrational thing to do, but people still do it sometimes without thinking. But EASY English words aren’t replaced. If I were speaking to a bunch of Americans, it could happen that I said something along the following lines: “Okay my friends, let’s get ready for the new semester and… oh WAIT! I just got an urgent text message from the kursansvarige!” (Kursansvarige=Person in charge of an education program at the university, I actually don’t know what that title might be in English, so this is something I might irrationally blurt out in Swedish when I couldn’t find the English word.) But there’s NO WAY I would say “Okay mina vänner, let’s get ready for the new semester and… oh VÄNTA!” That’s just not how anyone talks. The substitution thing bothers me too. A few levels down from “dean”… Like someone who’s only in charge of the content of the specific education program for philosophy and economics combined or the like? Which might not even be a thing in American or UK universities? But yeah, anyway, THAT’S the kind of word where you might throw in something from your native language. Although it would just look weird to do that in fiction, so better not substitute words at all. Director or department chair, maybe? It sounds like “department head” maybe. But it illustrates your point because while that’s derivable from English words meaning related things, you’d pretty much have to guess it from among several other phrases that derive just as well (some of which we use). Yeah I think it doesn’t have an exact corresponding English term. Which happens sometimes with specific roles, professions etc. But anyway, my point was just that it’s these tricky words that people sometimes blurt out in their native language in the middle of an otherwise English sentence, never simple words like “friend” or “wait”. When you want to do a mix of languages like that, you have two options: Substitute a word common enough that the audience might know it, guaranteeing that they understand the sentence, or substitute one rare enough that the character might not, forcing the audience to rely on context to sort out what’s being said. …Or just don’t do it, I guess. Maybe an unthinking interjection. The equivalent of a “Hi” or “Sorry” or “Oops” – the kind of thing you say when you’re talking as much to a situation as a person, and without your brain having to kick in. (A friend of mine lived in Austria for several years, and it took him a while to stop saying danke in instead of thankyou when he returned). A setting I’ve developed uses sign language semi-regularly, generally paired with spoken speech as well. Unfortunately, I don’t know of many texts that transliterate sign language, so I know only a few do’s and don’ts. Any tips? The Story of Edgar Sawtelle has a mute main character. Whenever he “speaks,” the author uses italics for his words to indicate that he’s talking in sign language. So that’s one option. Granted, I’m not an expert, but the way I’ve seen it done a few times (lately in Riordan’s The Sword of Summer), when the character who uses sign language is first introduced, it’s explained what they’re doing (something along the lines of “he made the signs for ‘me’, ‘shop’ and ‘jacket’ before shrugging”). Then a proper translation is given in italics (“Maybe I’m going to buy a jacket”), and then every other time that character would show up, the author just mentioned that they start signalling, and write a proper sentence in italics, without mentioning all the signs going into it (” ‘I think John has the key’, she signed”). Unless you’re writing for a rather specific demographic, I think writing the individual signs won’t achieve much beyond slowing down the pacing. That’s a cool idea. Some people will be offended by this but you definitely want the sign components of the language to be geared toward hunting, combat and building activities, any environment where there is a lot of noise or where you want to communicate in silence. A womens hands are always busy so it would have to be possible to communicate about anything done around the camp sight or with children, without using hand signals. In such a society sign language would be considered masculine. There would be signs and words for most words, so a characters choice in communicating with signs or words could say a lot about them or their intentions. Hope that gave you some ideas ? Thanks for the replies you all! I’ve been doing something a little bit between the italics-only and the signs + italics, so I’m glad that seems to be an established way to do it. Riordan’s method is a pretty good one, I might adapt that! 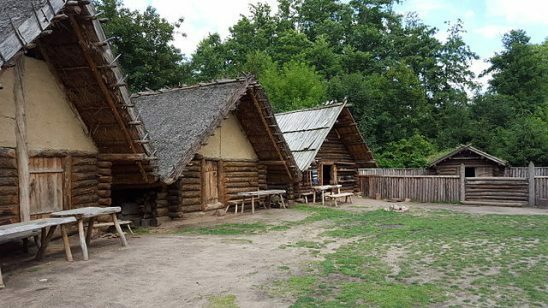 Probably gathering rather than building – building would be an in-camp activity, and probably wouldn’t have been very noisy at the time this linguistic habit was forming. Meanwhile, if you’re evoking hunter-gatherer roles, women going out gathering would have had to keep quiet just like the hunters did. In that case, sign language might be an “outdoor” rather than “indoor” thing. One form of communication might be considered more intimate (sign because it takes place among smaller groups, or speech because it’s used where it’s safe) – or possibly more secretive (sign because it’s designed to conceal the speaker from danger, or speech because it’s used away from prying eyes). That was meant to be a reply to Leon. Good point about the building. Like i said, everything would have a word and a sign. But you use what your familiar with and what’s easy. I was a soldier and I have a 17month old daughter. I can tell you for a fact that if you are running a house and wrangling a little goblin, 9 times out of 10, you are not using your hands to communicate. Children would certainly use signs for sharing secrets. Adults doing so would probably be frowned upon. Oh! There would also be small signs and big signs, like semaphore. There’s probably a lot of fun to be had with this concept. I don’t know about The Story of Your Life, but in the case of Arrival, I was left wondering if the time-opening language wasn’t just a normal language, but something more rooted in the structure of the universe itself. It’s mentioned that is has no correlation with the heptapod aliens’ spoken language,and that would fit in with the “benign Lovecraftianism” (not my coinage, but I like it) vibe of the film. The biggest problem I’ve seen is simply the fact that everyone has the same language. You see this in nearly all fantasy and sci fi. Most times they don’t even attempt to explain it, as with a “universal translator” or something similar. No, it’s just automatic. At times we can assume the other people are speaking their own language and it’s translated for the audience. Not when they’re speaking with people from another group though. A similar thing you almost always see is the aliens having just one language (and a single culture). That could be justified as being the dominant language (like English), but in most cases they aren’t even mentioned as having any others. Thus we have “the Klingon language” and so forth. One last minor thing I’ve heard about: linguists note that “High” usually gets used for “Old” in terms of a language. However in reality they call languages that when they come from a higher region geographically. Is “Old” just too gauche or something? “Student” is the same for girls and boys in Spanish. We use the same word (“estudiante”). I just remembered one more thing which is really stupid, but you see it in TV shows and movies all the time: A hearing and a deaf person talks in sign language, but the hearing person keeps repeating everything that’s said out loud, for the benefit of the audience, even though this makes zero sense in-universe. I wasn’t that fond of the movie Baby Driver, but one thing I give them massive props for is NOT doing this thing when Baby talks with his deaf foster Dad. They just speak sign language like normal people do, and then there are subtitles for the audience.